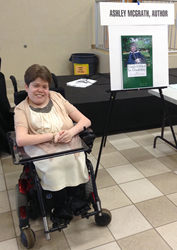 Ashley McGrath Shares Her Experiences Growing Up with a Disability in Her Autobiography "UnabASHed by Disability"
In honor of Rare Disease Awareness Day on February 28, Vocational Rehabilitation shares a woman’s journey to success at work. Ashley McGrath promotes her new book "UnabASHed by Disability"
It describes my childhood as an individual with physical disabilities,” Ashley explains. “Despite its description of my challenges, my book is of an inspirational nature. Writing it was very rewarding. When Ashley McGrath was only three months old, doctors told her parents that she may not live to see her first birthday. She was born with a rare genetic condition, campomelic syndrome, that causes serious bone abnormalities and weak muscles, and the doctors believed that it would create serious limitations even if she did survive. Almost 30 years have passed since then, and Ashley has accomplished more than they could have thought possible. She has a graduate degree, a job, and a published autobiography — and she owes it all to her own determination and a little help from Vocational Rehabilitation (VR), a federal-state agency that helps people with disabilities get or keep a job. Ashley first came to VR in 2003 when she was a senior in high school beginning to think about her plans after graduation. She wanted to attend college, so she met with her VR counselor, Karen Johnson, for help achieving her goal. During her time in college, VR provided a hearing aid system to ensure she would be able to participate fully in all of her classes. The assistance paid off; after years of hard work, Ashley earned her Master’s degree from the University of Central Florida in 2010. With so much on her schedule, Ashley is busy — but she has no plans of slowing down anytime soon. In the future, she hopes to continue working while pursuing additional speaking engagements and writing a children’s book dealing with special needs.